Allison Biederman and her family enjoy a lazy Sunday after canoeing down the Connecticut River. Launching canoes into the Connecticut River is a fine start to a nice day on the water. Paddling with family or friends is a way to reconnect and share an activity without the distractions of our daily lives (though cell phones do work on the river, carefully packed in two Ziploc bags in the event of a capsize). 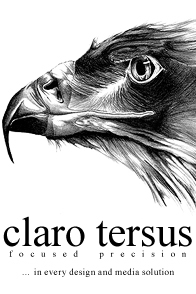 We had three generations in our party, including a seemingly content teenager, but what of the connections to those outside your boat? How can a canoe unify your world? Canoe-nification, that’s how. 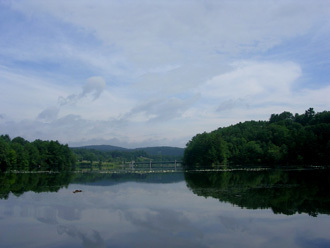 The Connecticut River divides the states of Vermont and New Hampshire, so you’re either in one state or the other. But on the river, you’re connecting the two states, the two communities. 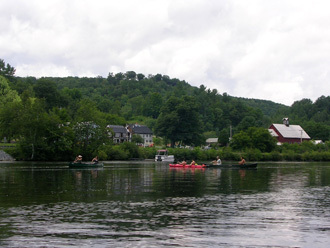 We began just north of the Wilder Dam at the West Lebanon, New Hampshire launch, and could see the Wilder, Vermont recreation area across the way.. We paddled north to Hanover, New Hampshire with Dartmouth College on our right, and Norwich, Vermont with the Montshire Museum on our left. 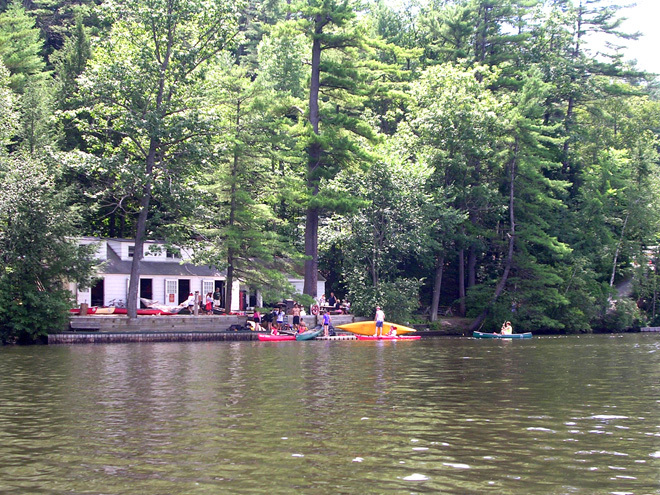 Dartmouth’s Ledyard Canoe Club rents boats for use on the river. In the watery separation between Vermont and New Hampshire, we enjoy a wealth of recreational opportunities missed by driving our cars across the bridges overhead. 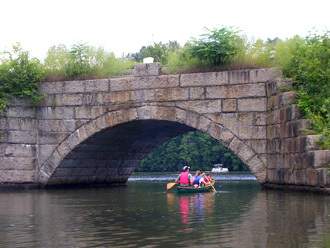 The Connecticut River and its tributaries are prime waters for canoeing, kayaking, and other boating activities. In the span for four hours, we met other canoes – both owned and rented, kayaks, a two-person shell, a bass boat, a party barge, two motor boats pulling tubes, and surprisingly, a 20-person war canoe from the Dartmouth Outing Club. Even more surprisingly, the behemoth canoe was so fast we couldn’t hope to catch it, denying me of a great photo opportunity. Off the river, we were passed by the Green Mountain Flyer, a sightseeing passenger train with a very social engineer, well versed in whistle tunes, and many passersby. In a canoe, conversations are easy with those you pass. One family had rented a canoe from Dartmouth and asked us about our travels. A swimmer kept to the shoreline, but was friendly as our paths crossed. The fishermen moved about the river and we respected their line space. What struck me most of all was on our return trip to the launch site when we came upon a motor boat with a green inflatable tube with a joyous rider upon it. This motor boat, on seeing our two canoes, stopped so we weren’t swamped by waves. I don’t believe that canoes have right-of-way over motorized craft, but I do believe that these motor-boaters made a tremendous effort to share the river. Had the motorboat passed us at full speed, we would have turned our canoes toward the wake and, without much thought, paddled on our way. Instead, we receive consideration. We found common courtesy on open water, between the powerful and the meek. There is no ceremony to mark our experience, just our own sense of canoe-nification to guide us.